PostgreSQL or Postgres is an open source object-relational database management system (ORDBMS) with more than 15 years of active development. It's a powerful database server and can handle high workloads. PostgreSQL can be used on Linux, Unix, BSD and Windows servers. PostgreSQL provides several ways to replicate a database. It can be used for backup purposes and to provide a high availability database server. In this tutorial, we I will show you how to install and configure PostgreSQL replication by using hot standby mode. Hot standby mode is easy to configure, and it's a very good starting point to learn PostgreSQL in depth. Hot standby mode requires 2 database servers, we will use Ubuntu as operating system on both servers. Master Server - accepts connections from the client with read and write permissions. Slave Server - the standby server runs copy of the data from the master server with read-only permission. 2 Ubuntu servers - 1 for master and 1 for slave. Root privileges on the servers. Some basic knowledge about Ubuntu, apt, etc. Now set the hostname for both servers - master server and slave server - with the hostnamectl command. After Postgres installed, give a new password for postgres user (created automatically when the installation). Type your postgres user password. In this step, we will configure the 'master server' with IP address '192.168.1.249'. We will create a new user/role with special permission to perform the replication, then we edit the PostgreSQL configuration file to enable the hot standby replication mode. New replica user has been created. Next, go to the PostgreSQL directory '/etc/postgresql/9.4/main' to edit the configuration file. Uncomment line 59 and add the server IP address. In the WAL (Write Ahead Log) setting line 175, uncomment and change the value to hot_standby. In the checkpoints section line 199, uncomment the 'checkpoint_segments' and change the value to 8. In the archive section line 206 and 208, turn on the archiving option and add the archiving command. In the replication section line 224 and 226, change the value to the max number of WAL sender process. Save the file and exit vim. Next, edit pg_hba.conf file to allow the replication connection. In the end of the line, add a new configuration for user 'replica' to make the connection. Configure the slave server like the master server. Use su to become the postgres user and go to the PostgreSQL configuration directory. Uncomment line 59 and add the slave server IP address. Go to line 175 and uncomment the wal_level setting, change the value to hot_standby. Uncomment line 199 on the checkpoint section. Uncomment line 224 and 226 to configure max_wal_sender process. Uncomment line 245 to enable hot_standby mode on the slave server. In this step, we will move the PostgreSQL data directory '/var/lib/postgresql/9.4/main' to a backup folder and then replace it with the latest master data with 'pg_basebackup' command. Run all the command sbelow on the slave server only! Now login to the postgres user and rename the 'main' directory to 'main_original' as a backup. 192.168.1.249 is master server IP address. And you will be prompted to entering the password for user 'replica' for the replication. Make sure there is no error after run the start command. Go to the master server and log into the postgres user, then run the command below to see the replication info. 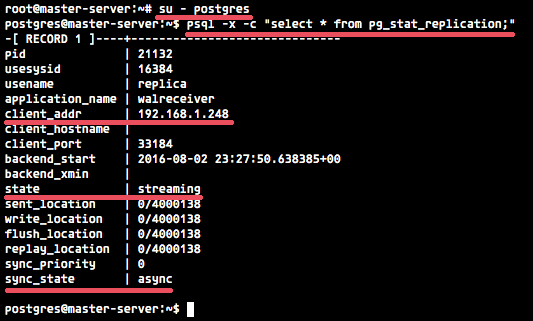 psql -x -c "select * from pg_stat_replication;"
Next, test to create a new database from the master server and then check that the database exist on the slave server. Now login to the slave server and check that the 'howtoforge' database has been mirrored to the slave server automatically. The database has been replicated from the master server to the slave server. Why the copy command is interactive? I think the use of the -i flag isn't appropiate. I don’t understand clearly …/main parts equal to what in my configuration path?I guess it is equal to /usr/local/pgsql/data in my configuration. Am I right?? ?